This document describes the default and optional LTI parameters that itslearning supports and the values that are passed to the Tool Consumer. Optional parameters that are not listed here, are not supported and will not be passed. Does not currently support outcome service for grade pass-back. Content Item (mime type: application/vnd.ims.lti.v1.ltilink) sent back to itslearning (CK-Editor) from a LTI Deep Linking Plugin and that will be launched as a basic LTI launch from the CK-Editor. The following LTI parameteres can be passed for both LTI 1.0/1.1 and LTI Deep Linking 1.0 tools. For some of the parameters, different values will be passed based on LTI features (as defined in table above) and context (e.g. Course context, in Library or other locations). Also some parameters will only be passed in a given context and under certain conditions. Please have a look at the description/value in the tables below for more details. Not really used, returning a default value. 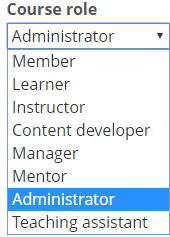 Comma separated list with institution roles and context roles of the user. Full URN is always provided. Translation of itslearning roles (Guest,Learner,Staff) to IMS roles (Guest,Learner,Instructor and IMS LIS dictionary roles). Based on Role in hierarchy for the Site Profile. In a course context, the Course Role from the Course Profile is sent (see image below for supported values). Note: This is platform user id, and not the itslearning person id. This field communicates the kind of browser window/frame where the TC has launched the tool. Fully qualified URL where the TP can redirect the user back to the TC interface. Identifier for course. Only passed for role Learner and if the tool is configured to support Assessment in itslearning. Identifier for Learning tool instance in course. Only passed for role Learner and if the tool is configured to support Assessment in itslearning. Fully qualified URL for grading results passed back from tool provider. Only relevant if the current context supports grading. User identity, either person sync key (used across system integrations) or user id of Platform user entity id. This is platform user id, and not the itslearning person id. Unique result identifier of the assessment record item (the id of an item for grading of a particular student work). Only passed for role Learner and if the tool is configured to support Assessment in itslearning. These parameters are only passed in LTI Deep Linking launch (lti_message_type=ContentItemSelectionRequest) for LTI Plugins. Fully qualified URL where the TP redirects the user back to the TC interface. An opaque value that must be returned by the TP in its response.